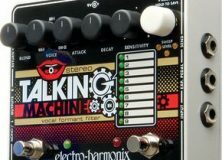 The guys of Electro-Harmonix have been going nuts with overdrive and distortion pedals lately. 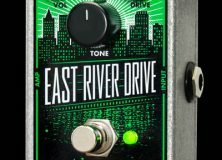 Before this year the guitar effect pedal gurus have been well known for their fuzz classics and their thick distortion pedals, even a wide range of experimental boutique pedals, but now at the cusp of the new year they’ve been voraciously expanding their trademarks into new territories. Overdrive. There was the reissue of the Hot Tubes as the miniaturized overdriver, then the East River Drive. Then along came the OD Glove, and now we’ve got the Soul Food. 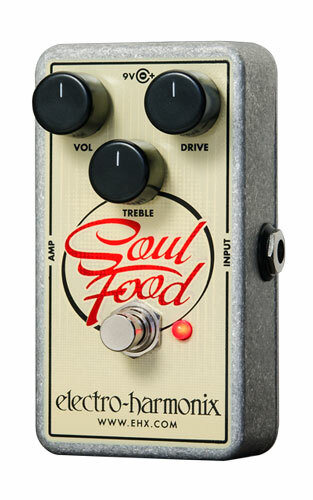 The Soul Food is a miniature overdrive pedal. With a volume, a drive, and a tone knob, it works just like any most other overdrive pedals out there. You plug in and tweak to perfection. But what makes the Soul Food a bit more interesting than the average driver is the source of inspiration. That inspiration is the Klon Centaur. I’m not going to derail the topic for too long, but to put the Soul Food into perspective let’s take a moment and look at the Centaur. Once upon a time there was a pedal manufacturer called Klon. Klon had released the Centaur – an older boutique overdrive pedal from the 90s. I’ve never come across one of these personally, but rumor has it they are the stuff of legends. There are always skeptics, though, even when it comes to pedals so revered. I have my own theory on the skepticism. Getting your hands on the Centaur doesn’t come without a price. Production ended long ago, and after a bit of digging around the only actual original Klon Centaur I found was on eBay for a stunning $2,500. The Centaur might be a classic, but I think the big argument is just how good is that sound? There have been some other Centaur models along the way, but they’re not exactly any more common, they feature different hardware, and at the end of the day they’re all probably more so collectors items than they are the pedals people buy because they need them for “that sound”. The Soul Food steps in to offer as close of a replication to the Centaur as possible, but actually possible to get a hold of. One aspect that earned the Centaur so much respect was that it played so well with other pedals. In an analogy it was probably more like a seasoning on a meal as opposed to the main course itself. So by design it would flourish other pedals in the chain, but it would never squander the overall tone with its own personal agenda. The Soul Food is designed to deliver that same kind of flair. 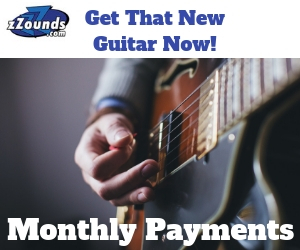 Your signal gets all the headroom it needs to sculpt your tone as you like, while getting the crispity, crunchity grit you need to colorize your sound, but not an overly compressed sound. 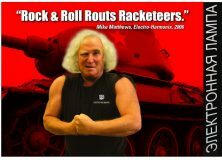 The buffer was another aspect behind the Centaur that earned it a lot of respect, but in this day in age some people want true bypass, and others want buffers. Different strokes for different folks. The cool thing is that EHX thought in advance. The Soul Food has an internal switch that lets you swap between true bypass and a high quality buffered signal. The Soul Food holds a price tag of $62.81.